This article was contributed by Professor Ian Crawford of Birkbeck’s Department of Earth and Planetary Sciences. It was originally published on The Conversation. To date, all human economic activity has depended on the material and energy resources of a single planet; understandably, perhaps. It is conceivable though that future advances in space exploration could change this by opening our closed planetary economy to essentially unlimited external resources of energy and raw materials. Look up at the Moon this evening, and you might be gazing at a solution. The Earth’s closest celestial neighbour seems likely to play a major role and already a number of private companies have been created to explore the possibilities. It is important to stress that even now, 40 years after the Apollo missions, we still don’t have a complete picture of the Moon’s economic potential, and obtaining one will require a more rigorous programme of lunar exploration than has been undertaken to-date. In part, this is why proposed future lunar exploration missions (such as the recently announced Lunar Mission One) are so important. 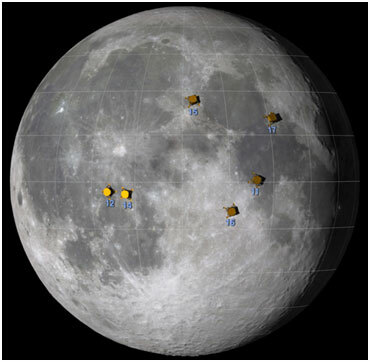 Nevertheless, as a result of work over the past four decades, we do now know enough to make a first-order assessment of lunar resource potential. In doing so it is useful to distinguish between three possible future applications of such resources. We have the option of using lunar materials to facilitate continued exploration, and future economic development, of the Moon itself. The concept is usually referred to as In Situ Resource Utilisation, or ISRU. We can consider the importation of lunar resources to the Earth’s surface where they would contribute directly to the global economy. Recent work – which I have summarised here – has shown that the Moon does possess materials suitable for ISRU. Most important in this respect is evidence for deposits of water ice and other volatiles trapped in cold (less than 100 Kelvin or minus 173 degrees Celsius) and permanently shadowed craters at the lunar poles. In addition to being required for human life support, water is also a ready source of oxygen (required for both life support and rocket fuel oxidiser) and hydrogen (a valuable rocket fuel). 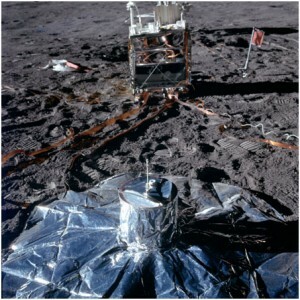 In addition to possible ice deposits, it has been known since the early studies of the Apollo samples that the lunar soil contains volatiles, substances derived ultimately from the solar wind (e.g. hydrogen, helium, carbon, nitrogen, and at high latitudes, hydroxide and perhaps water), and these may also be exploitable for ISRU activities. Although ISRU will undoubtedly benefit future scientific exploration, it is true that such activities will only make wider economic sense if further lunar exploration and development is able to yield net benefits to the global economy. 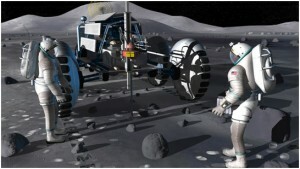 It is here that the second of those three potential applications of lunar resources comes into play. Our global civilisation is already highly dependent on Earth-orbiting satellites for communications, navigation, weather forecasting and resource management, and this reliance is likely to increase. The high costs of these activities are largely dictated by high launch costs, and by the fact that failed satellites cannot currently be repaired or replenished in orbit. The availability of resources obtained from the weaker gravity conditions of the Moon would help mitigate these obstacles to further economic development in Earth orbit. Near-term lunar exports to a cis-lunar infrastructure could include the supply of hydrogen and oxygen as rocket fuel/oxidiser. In addition, lunar surface rocks and soils are rich in potentially useful but heavy (and thus expensive to launch from Earth) raw materials such as magnesium, aluminium, silicon, iron and titanium. Therefore, if a lunar industrial infrastructure is gradually built up, the Moon may be able to provide more sophisticated products to Earth-orbiting facilities. Examples might include titanium and aluminium alloys for structural components, and silicon-based photovoltaic cells for solar power. 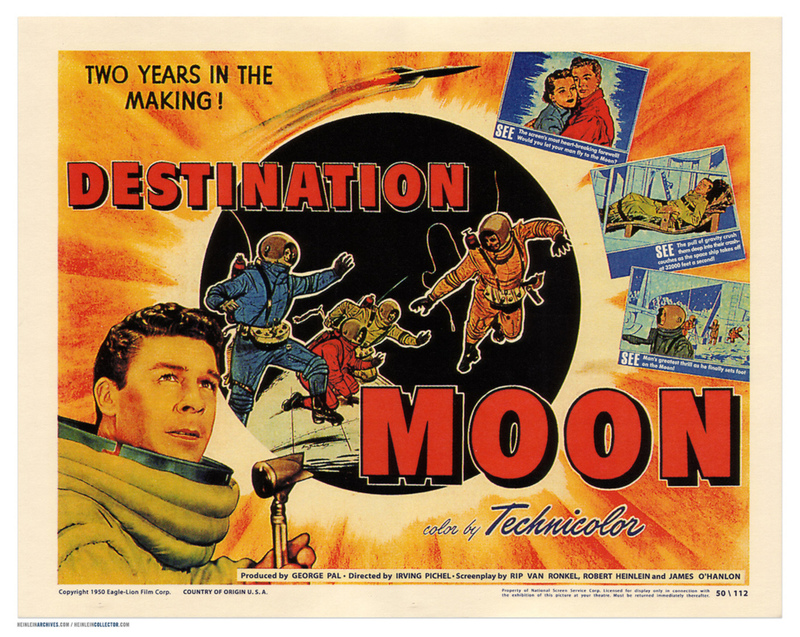 The key business case for sourcing these materials on the Moon is simple. It takes about 20 times less energy to launch a given mass from the surface of the Moon into Earth orbit compared to launching it from the Earth’s surface to Earth orbit. This all seems pretty encouraging for any company or country considering drilling on the Moon, but opportunities for lunar resources to make a more direct contribution to the world economy by being imported to the Earth’s surface are limited. This is because the Earth already contains the same basic mix of chemical elements as does the Moon, many of them in higher localised concentrations (i.e. ores), and we have a well-developed infrastructure for extracting and refining terrestrial raw materials. The light isotope of helium (helium-3), which is implanted into lunar soils by the solar wind is often cited as an exception because it is perceived by some to be a potential fuel for future nuclear fusion reactors on Earth. However, sustainable nuclear fusion using helium-3 has yet to be shown to be practical, and even if it is, the concentration of helium-3 in lunar soils is so low (about ten parts-per-billion by mass) that strip mining and processing hundreds of square kilometres of the lunar surface would be required each year in order to make a significant contribution to Earth’s future energy needs. 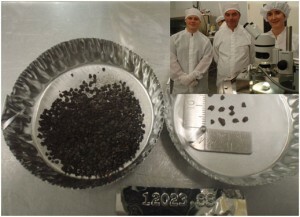 Other possible lunar materials which might conceivably be economically imported to the Earth include platinum group elements (currently valued at between $20,000 and $50,000 per kilo) extracted from iron meteorites that may have survived impact with the lunar surface, and materials (for example, economically valuable rare-earth elements which are known to be concentrated in some regions of the Moon) for which the environmental costs of terrestrial mining may one day make lunar sources more attractive. When we pull together the evidence, it remains difficult to identify any single lunar resource that will be sufficiently valuable to drive a mining industry on its own. There is no simple solution. However, the Moon does possess abundant raw materials that are of potential economic interest. We need to think of a hierarchy of future applications. This begins with the use of lunar materials to facilitate human activities on the Moon itself. We can then progress to the use of lunar resources to underpin a future industrial capability within the Earth-Moon system. In this way, gradually increasing access to lunar resources may help “bootstrap” a self-sustaining space-based economy from which the global economy will ultimately benefit. This post was contributed by Dr Amy Harrison, PhD, DClinPsy. Dr Harrison is a Clinical Psychologist and teaches Positive Psychology as an Associate Lecturer. Her clinical work focuses on helping young people with eating disorders and her research focuses on how people manage emotions and experience pleasure from social interaction. ‘Blue Monday’ – the third Monday in January (today) – has been reported as one of the grimmest days of the year. Although there may be no hard science behind this assertion, it’s easy to understand why it’s developed this reputation. The merriment of Christmas has long since faded but the mountains of credit card debt remain as we struggle through to payday; New Year Resolutions have fallen by the wayside; and the next Bank Holiday feels an aeon away. However, there are ways that you can tackle these ‘blue’ feelings. It’s important to remember that it’s not what happens to you, but what you make of it that is important. Research from the field of positive psychology, which aims to understand the science of happiness and wellbeing, suggests that there are things we can all do to manage the daily grind with greater ease. Make an effort to look out for positive things during the day – we can train ourselves to notice more of the good stuff, no matter how small. Do something for others – give up your seat on the train, feed a parking meter or smile at a stranger. You’ll be surprised at how warm this makes you feel. Count your blessings – write about something you’re grateful for, or thank someone for helping you. Look at a picture of your favourite person, experience or animal – research has shown that this can significantly improve your mood. 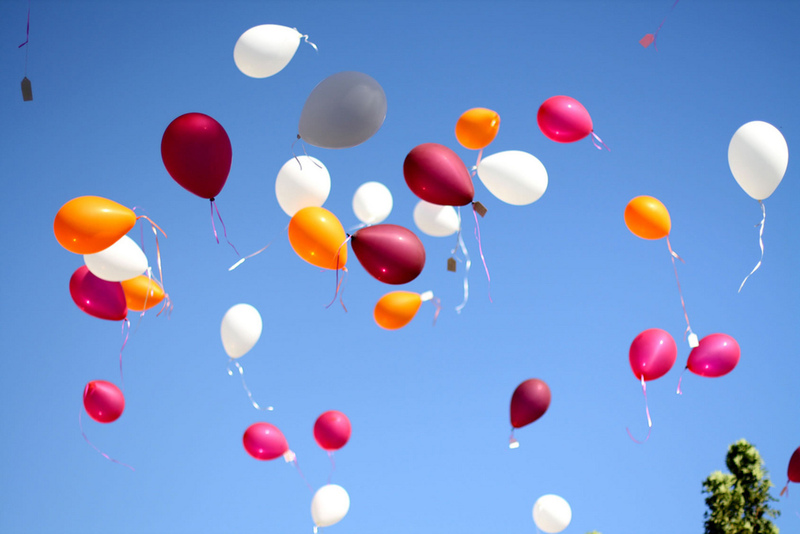 Many people might be surprised to hear that these small actions can have such a positive impact on mood. However, it’s worth a go – one thing that can be guaranteed is that if you don’t try anything different, things will stay the same. On Monday 25 February Birkbeck held an Athena SWAN mentoring event, primarily aimed at women working in STEM (science, technology, engineering and mathematics) fields. 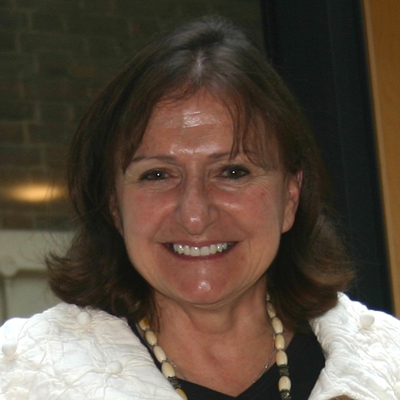 Professor Annette Karmiloff-Smith, Professorial Research Fellow in the Department of Psychological Sciences, shares her advice, gained over her 36-year career as an academic in Switzerland, Holland and the UK . My experience with mentoring young scientists has been that most females focus on how to balance career with having children, and less often on how to advance their careers, yet of course they should do both. By contrast, males tend to focus mainly on career advancement, rarely raising the problem of balance with family life, yet they too should do both. Academics often have academic partners, although the problems are just as difficult when one partner’s career is outside academia. One lesson I have learnt is that one must discuss everything beforehand. Don’t wait until the problems arise and resentment creeps in. Be objective, realising in advance that one of you may get a superb offer in a place where the other cannot find something suitable. What will happen if that arises? Whose career will have precedence (certainly not automatically the man’s!)? How will you find compromises that meet both your needs to some extent, even if not to perfection? Whose career is more transportable? All these issues must be faced in advance, without which debates end up in resentment for one party and guilt for the other…. often resulting in a doomed relationship. You have to ask yourself, which is more important: career or relationship, even if both are important. The solution isn’t to pretend the issue won’t arise! Many young academics desire a child. It is often assumed that a busy career means a single child. In a newspaper article many years ago, Katherine Whitehorn raised the question “one child or many?” and concluded that, if you are a busy professional, it may be better – albeit counterintuitive – to have several children! She reasoned that a singleton waits desperately for mum (or dad) to come home, whereas several children just muck in together and barely notice their parent is away. What about maternity leave? Fortunately, since I was a mother, maternity (and paternity) leave has vastly improved, so you could devote yourself entirely to the new arrival. This is clearly your right, but is it such a good idea? My advice is that, if you intend to pursue your career, then don’t cut off completely during the maternity leave. Save a special time each day to check email, read the latest article, jot down notes for your next article or research project. You are going to have to juggle both once you return to work, so start practising gently now. Remember that the smaller the baby the more s/he sleeps, so take your baby to special lectures or a conference. Feed the baby just before it starts and hopefully s/he’ll sleep right through. Do sit on an aisle seat, though, in case s/he starts screaming!! And, once you’re back fulltime at work, agree with your partner in advance on how you will both decide who will come home anytime the baby is sick – not automatically the mother! When you had no home responsibilities, it may have been fine to dabble in numerous research projects, but once there are family responsibilities, it is essential to focus your research. Try to arrange to teach on courses that are related to your research so that your reading serves both. Remind yourself frequently that you cannot be superwoman! Keep an eye on your health and remember that sleep isn’t only a time of rest, but that parts of the brain are more active during sleep than wakefulness and that sleep is critical for the consolidation of memory. Avoid guilt, and learn to say “No” to requests to take on extra tasks. Protect yourself at this time of your career; you can be an avid volunteer in the future. Tell yourself that it’s OK to use day-care and, when you drop off your child, leave with a confident stride. Babies pick up on their parents’ doubts. Do ask for help when you need it. You don’t have to prove you can do it all alone. A personal ending: I thought that when my daughters left the nest, had their own careers and families, I could simply get on with my career without a second thought… Alas no! Now the potential guilt raises its head again: how do I juggle expected grandmother duties (I have seven) with the pressures of my academic career? Rest assured, I have no regrets… having children, grandchildren and a busy career have fulfilled my life. Fig. 1. 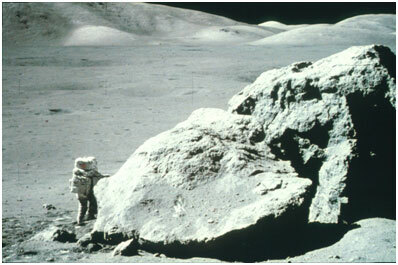 One of the last two men on the Moon: Harrison Schmitt stands next to a large boulder at the Apollo 17 landing site in December 1972. (NASA). Today, 19 December 2012, marks exactly 40 years to the day since the last human beings to set foot on the Moon, Gene Cernan and Harrison “Jack” Schmitt of Apollo 17 (Fig. 1), returned safely to Earth. In the three and a half years between Neil Armstrong’s ‘first small step’ in July 1969 and the departure of Cernan and Schmitt from the lunar surface in December 1972, a total of twelve astronauts explored the lunar surface in the immediate vicinity of six Apollo landing sites (Fig. 2). Fig 2. The Apollo landing sites. Note their restriction to the central part of the nearside – there is a lot more of the Moon to explore! (Image: NASA). 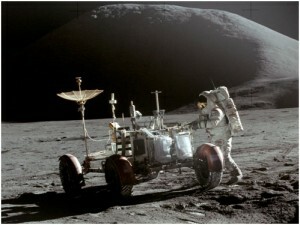 In their cumulative 12.5 days on the lunar surface, the twelve Apollo moonwalkers traversed a total distance of 95.5 km from their landing sites (heavily weighted to the last three missions that were equipped with the Lunar Roving Vehicle (or ‘moon buggy’), collected 382 kg of rock and soil samples, drilled three geological sample cores to depths greater than 2 m, and deployed over 2100 kg of scientific equipment (Fig. 3). The results from all this activity continue to have a major scientific impact today. Probably the greatest scientific legacy of Apollo has resulted from analysis of the 382 kg of rock and soil samples returned to Earth. One of the key results has been the calibration of the lunar cratering rate. Only by comparing the density of impact craters on surfaces whose ages have been obtained independently by laboratory analyses of returned samples is it possible to determine the rate at which meteorite impacts have created craters on a planetary surface. Analysis of the Apollo samples has enabled this to be done for the Moon, which remains the only planetary body for which such a data-set exists, and which is used, with various assumptions, to estimate the ages of cratered surfaces throughout the Solar System from Mercury to the moons of the outer planets. Fig. 5. The current theory of the Moon’s formation from debris produced by a giant impact on the early Earth is largely based on the geochemical analysis of samples collected by the Apollo missions (image: Wikipedia Commons). Another important result of Apollo sample analysis has been the evidence provided for the origin of the Moon. 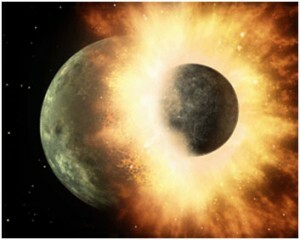 In particular, the discovery that lunar materials have compositions broadly similar to those of Earth’s mantle, but that the Moon is highly depleted in volatiles and has only a small iron core, led to the current view that the Moon formed from debris resulting from a giant impact of a Mars-sized planetesimal with the early Earth. It is very doubtful that we would have sufficient geochemical evidence usefully to constrain theories of lunar origins without the quantity and diversity of samples provided by Apollo. The Apollo samples have of course also been central to our understanding of the Moon’s own geological history and evolution. While lunar geology may at first sight appear to be a relatively parochial area of planetary science, it is important to realise that the Moon’s surface and interior retain records of planetary processes which will have occurred in the early histories of all the terrestrial planets. In all these respects the Moon acts as a keystone for understanding the geological evolution of rocky planets, and is an area in which we at Birkbeck are actively engaged (Fig. 6). Fig. 6. Fragments of Apollo 12 soil sample 12023 at the Lunar Sample Laboratory at the NASA Johnson Space Center, Houston, being selected for a lunar volcanic diversity study by Birkbeck scientists in 2009. Inset (left to right): PhD student Joshua Snape (now a post-doc at the Open University), the author, and Dr Katherine Joy (now at the University of Manchester); since this photo was taken Birkbeck PhD student Louise Alexander has also joined the project (photo: I.A. Crawford). In addition to study of the Apollo samples, many other areas of scientific investigation were also performed by the Apollo missions, especially geophysical investigations of the Moon’s interior (Fig. 7). Key results included the discovery of natural moonquakes and using them to probe the structure of the crust and mantle, geophysical constraints on the existence and physical state of the lunar core, and measurements of the flow of heat from the Moon’s interior. Although these data are over thirty years old, advances in interpretation means that they continue to give new insights into the interior structure of the Moon. For example, only last year an apparently definitive seismic detection of the Moon’s core, and strong evidence that, like the Earth’s, it consists of solid inner and liquid outer layers, was made by a re-examination of Apollo seismic data. Fig. 7. 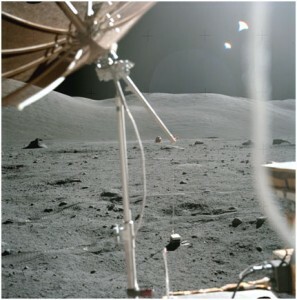 Apollo 14 seismometer deployed on the lunar surface; the silvery skirt provided thermal stability. 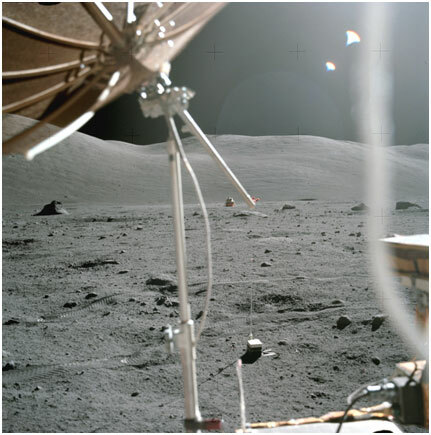 These instruments, also deployed at the Apollo 12, 15 and 16 landing sites, constituted the Apollo passive seismic network which remained active until 1978 and yielded valuable data about the interior of the Moon (NASA). Looking over the totality of the Apollo legacy, I think one could reasonably make the case that Apollo laid the foundations for modern planetary science, certainly as it relates to the origin and evolution of the terrestrial planets. Arguably, the calibration of the lunar cratering rate, and its subsequent extrapolation to estimating surface ages throughout the Solar System, could alone justify this assertion. If one also considers the improvements to our knowledge of lunar origins and evolution, and the records of solar wind, cosmic rays and meteoritic debris extracted from lunar soils, it is clear that our knowledge of the Solar System would be greatly impoverished had the Apollo missions not taken place. However, it is also clear that Apollo did little more than scratch the surface, both literally and figuratively, of the lunar geological record. With only six landing sites, all at low latitudes on the nearside (Fig. 2), it is clear that much remains to be explored. Moreover, precisely because we have the Apollo legacy as a foundation on which to build, supplemented by recent orbital remote-sensing missions, it is now possible to formulate much more sophisticated lunar exploration strategies than was possible forty years ago. There are now key, specific, scientific questions which can only be addressed by once again returning to the lunar surface (Fig. 8). Fig. 8. Artist’s concept of astronauts supervising a drill on the Moon. Returning humans to the lunar surface later in the 21st century would facilitate larger scale exploration activities than was possible with Apollo, and will further increase our knowledge of lunar and Solar System evolution (artwork: NASA). Therefore, as we pass the 40th anniversary of the last human expedition to the Moon, there are good scientific reasons to start planning for a return. However, unlike the Cold War competition that drove Apollo, a human return to the Moon in the coming decades would ideally be part of a sustained, international, programme of Solar System exploration such as the emerging Global Exploration Strategy. 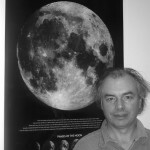 Ian Crawford is Professor of Planetary Science and Astrobiology in the Department of Earth and Planetary Sciences, Birkbeck, University of London. His group is actively engaged in a number of areas of lunar science, and has recently been awarded a grant of £99,300 by STFC to study lunar meteorites found on Earth. This blog article is based on a popular article published in the December 2012 issue of the Royal Astronomical Society journal Astronomy and Geophysics, and a more technical review paper just published in Planetary and Space Science.